When I first started training clients, I believed I’d be a magical blend of Jillian Michaels and Arnold Schwarzenegger. I envisioned yelling at my clients for “one more rep” and reminding them that “pain is just weakness leaving the body.” But with time, I’ve changed my tune. The reality is this: If you want to achieve a better body and improve your overall fitness, then you need to find a program that is safe, progressive and maintainable. Unfortunately, the fitness industry has created this somewhat impossible idea of what is considered fit and what it takes to get there. From fitness models and professional bodybuilders to unbearably low-carb diets, thousands of burpees, a weight that leaves you limping for the rest of the week and 50-grams-plus protein shakes…the “ideal” doesn’t represent a healthy lifestyle or a real one that we can maintain for any period. Now you shouldn’t run from anyone who pushes you beyond what you think you’re capable of or quit a program simply because it’s difficult. Rather, I don’t want you to fall victim to fitness industry myths and misconceptions. And this usually starts by hiring a personal trainer. The power that lies in the hands of a personal trainer is crucial. It can shape our bodies and alter our health. Experience: No, you don’t need a trainer who has a million credentials. But I’d suggest hiring a personal trainer who has vast experience working with different populations and scenarios. The wider their scope, the better able they are to provide solutions. And a trainer with corrective exercise experience and/or movement systems knowledge is priceless. Building a safe and effective movement foundation will “support” you for years to come! No yelling necessary: Sure, some people want a trainer who will yell obscenities and make them almost cry during a workout. But it isn’t necessary. 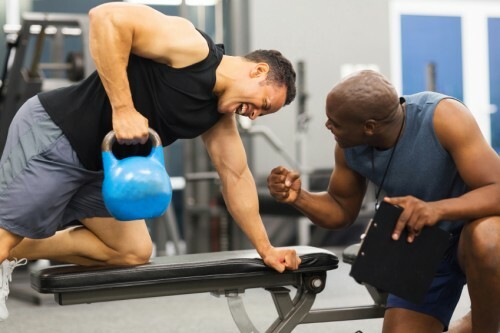 What’s more important is finding a trainer who motivates you even on your worst days and adjusts his or her approach to best suit you for the long haul. Does your trainer see beyond your appearance and go deeper to understand some of your obstacles, goals, passions, etc.? Beyond the gym: True health and physical improvement happen when we walk out of the gym. It’s the 23 or so other hours left in each day that can make or break our fitness goals. So are you receiving helpful tips and suggestions to guide you during these times? A trainer who can see beyond the session with you will help you achieve your fitness goals far faster than one who is only present with you face-to-face.